There are certain undeniable truths. The world is round. Nothing ever goes as planned. Laughter is the best medicine. Tomorrow is another day. Hawaii is always a good idea. The last one is easy to forget. There are so many tropical destinations from which to choose. Other countries. Different islands. New resorts. But it’s the Big Island to which you keep returning. The Kona Coast (the west coast) to be exact. That’s where the cool (both in temperature and vibe) town of Holualoa is located. The Old Mamalahoa Highway, Hawaii’s ring road, is lined with colorful, tin-roofed plantation shacks as it slows through town. They’re now filled with art galleries and unique shops. The sloped hillside, which tumbles down active Hualālai to the Pacific Ocean, is covered with volcanic soil and coffea plants. Their beans are brewed into some of the best coffee in the world. Holualoa is also home to your favorite inn. 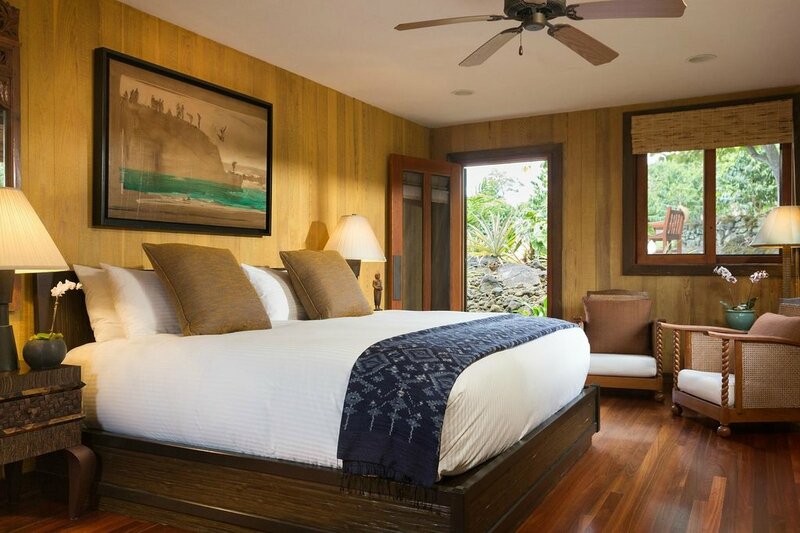 The Holualoa Inn is the inn that finally convinced you that you didn’t need to stay at a big resort. The open-air main house was built as a private residence on a coffee estate in the 1970s. Its original eucalyptus floors were restored when the home was turned into an inn in 1987. Traditional Polynesian furniture, local artwork, and a player piano were set up near the working fireplace in the great room. Gazebos and verandas were added to hidden corners outside. Some of them overlook the mosaic-tiled pool. A lava path leads to the fruit orchard. Walking trails meander around coffea plants. Plus the new Malulani Pavilion, decorated with sun loungers and a telescope, was built on the roof. It has a panoramic view of the ocean. 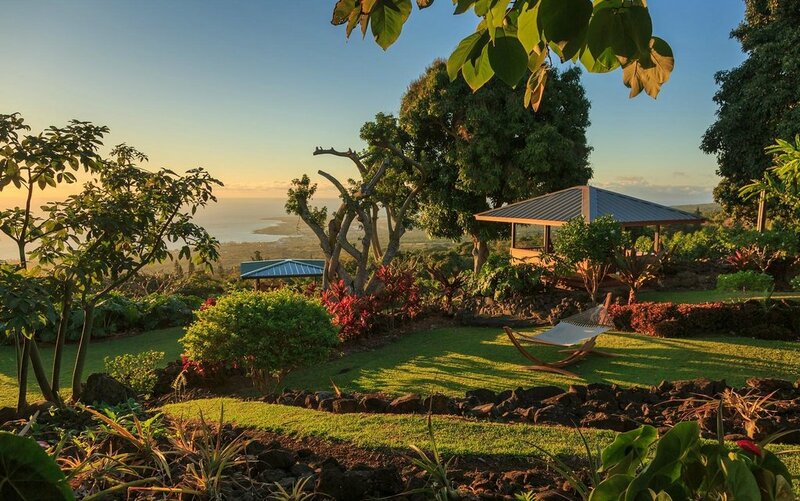 Between the gorgeous property and the stunning view, you spend most of your time outside at the Holualoa Inn. All of the accommodations are still distinct, though. The inn offers four rooms, two suites, a cottage, and a barn. The Coffee Cherry Room, adjacent to the pineapple garden, has become your favorite over time. It has a king-size bed, a little sitting area, and a river-rock shower inside. There’s a private sitting area with a hot tub outside. It’s your second-favorite spot, after the Malulani Pavilion, to watch the sunset. The comfortable room is stocked with lots of amenities, as well. It has a down comforter and fleece socks for cool nights. An alarm clock with a USB charger and a filtered water carafe sit on the nightstand. Organic artisan soap and beach towels are in the bathroom. There’s even a pocket flashlight, so a mongoose doesn’t surprise you during evening strolls. The owners’ thoughtfulness also extends throughout the rest of the inn. Estate-brewed coffee, fresh fruit, and a garden-to-plate breakfast are served each morning. You might eat apple, banana, and coconut pancakes with jaboticaba (berries) one morning and artichokes and baked eggs with lilikoi (passion fruit) the next. A cabana is stocked with beach and snorkel gear. Afternoon refreshments—homemade sweets, mixed nuts, and ice tea—are served late in the afternoon. Plus they’re happy to help you make arrangements, from diving with manta rays to dinner reservations, in the area. So have you booked this year’s Hawaii trip yet?